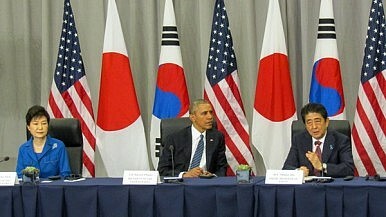 Obama, Park, and Abe emphasized their common position on North Korea’s recent nuclear provocations. On Wednesday, on the sidelines of the fourth and final Nuclear Security Summit (NSS) in Washington DC, U.S. president Barack Obama, Japanese prime minister Shinzo Abe, and South Korea president Park Geun-hye met in a trilateral setting. The three leaders discussed a diverse agenda, spanning topics of common interest in the region, but, unsurprisingly, the bulk of their time was devoted to discussing North Korea’s recent provocations. Following the trilateral meeting, Obama, Park, and Abe briefed the press, immediately zeroing in on the North Korean issue. Obama noted that the three leaders agreed “that trilateral security cooperation is essential to maintaining peace and stability in Northeast Asia, deterring the North Korean nuclear threat and the potential of nuclear proliferation as a consequence of North Korean activities.” Park echoed Obama’s remarks and focused on extolling the effectiveness of UN Security Council Resolution 2270 (UNSCR 2270), which codified the harshest sanctions against North Korea in a generation. Japan and South Korea both have alliances with the United States, but not one directly between the two of them. Owing primarily to their shared alliance with the United States and their interest in a stable regional status quo, the two countries have nevertheless come together with Washington to boost trilateral cooperation, primarily on the North Korea issue. For example, last year, the three sides agreed to boost their intelligence sharing on North Korea’s military and nuclear activities. Under that trilateral arrangement, both Tokyo and Seoul would use Washington as an intermediary for intelligence sharing, reflecting the limits in their bilateral relationship. In April 2015, Japan and South Korea resumed their long-suspended bilateral security dialogue. At the 2014 Nuclear Security Summit in the Hague, the three leaders had held a similar trilateral meeting that also marked the first time Abe and Park met in person. Though relations between Japan and South Korea remain difficult over historical issues and other disputes, North Korea’s unusually provocative behavior since January’s purported test of a thermonuclear device has brought Tokyo and Seoul together. At a separate bilateral meeting between Obama and Chinese president Xi Jinping, North Korea was also a major topic of discussion. Despite a 2015 deal, the "comfort women" dispute between Japan and South Korea continues to have salience for bilateral ties.